THE TUNDRA TABLOIDS REPUBLISHES ITS INTERVIEW WITH LARS VILKS……. – The Tundra Tabloids……. THE TUNDRA TABLOIDS REPUBLISHES ITS INTERVIEW WITH LARS VILKS……. Tundra Tabloids:Greetings to everybody, I am sitting here with Lars Vilks, who has just held an event in Stockholm, translated from Swedish, “A Day For Freedom of Speech”, would that be correct? Tundra Tabloids:Right, now first of all, about the event that took place yesterday, could you give me your thoughts or comments on what you hoped to achieve by that…collage of different videos concerning the Mohamed dog cartoon, the roundabout dog, and your answer to your critics? Lars Vilks:There are many frontiers in this drama, I have one that goes with my main project which is about the art world, and the agenda they have in the art world, and when they do something incorrect, which is very obvious, and I’ve done it just to find out about what is the situation to critique what is the freedom within the art world and this was just one way of protesting, to keep it alive, to kind of follow up with documentation that I’m very well aware of working with this very huge project, as well as everything that happens can be part of the art work. When you make a musical, you make this possible to view. You make this a part of a summary, in a kind of an amusing form. I mean, I didn’t expect, and I do not expect, because I haven’t seen any of the reactions yet from that point of view, but I think that it’s too early to have some sort of communication with the art world. So this is an ongoing thing. I have to wait I mean, and that’s the point I think, if it went to fast it wouldn’t be so serious. When you crash into some sort of institutional critique and you’re really serious about it, then you, I mean, either you do something which is totally stupid and impossible, or otherwise you really hit the nail and then you have to wait to see what happens. That’s one thing, the other thing of course is what goes on in the world. The world is also fascinated by this, I mean really, it’s mostly with the Arabs with things going on. And that went alright. It was the first bloodshed we had yesterday? Lars Vilks: It was the first bloodshed? Tundra Tabloids: Ok, now for our viewing audience here, could you please take us through the history of what led you to draw the Mohamed dog cartoons? Lars Vilks:Yeah. It’s rather trivial story which I think is important because people mean that I had an aim to put a political issue behind it, but that was very limited, very limited, because the only thing that I was interested in was, to do something which is not allowed in art, and that is to criticize Islam, come up on the Muslims side, while you can of course criticize terrorists, United States and terrorists, and things like that which is normal to do. So, but this was a very small exhibition, the theme of a dog in art. So I should do something with a dog, do something to provoke with dogs, such as with a prophets head on that dog. Tundra Tabloids:What has, in your own personal opinion, been the public’s reaction to the dog cartoons here in Sweden? An overall view. Has it been entirely negative, eh positive? From the event held yesterday, I, we saw first hand the critics, and your answer to the critics in the short videos, what is your overall viewpoint concerning Swedish society and how they have taken your display of this cartoon? Lars Vilks:Yeah, I’ll say that there has been of course defenders of these things, defenders of the freedom of speech, and then you have the other criticizing that you are attacking a weak group which is an immigration problem, and things like that. I think there’s a basis, it should be fair to say that there are more criticizing that are supporting. But it’s not totally unbalanced, it’s not totally unbalanced, it’s a rather reasonable unbalance, but the strong forces are of course those who are criticizing because they are standing on the political correct, political correctness already, and so, but I mean all these things is of interest to me because then I’m kind of am mapping, because I came as a newcomer into this, this countryside, and I can kind of see all these different camps and how they attack each other and what sort of arguments they use. Tundra Tabloids:In Finland, it is known that when the Mohamed cartoons came out in Denmark, in the Jyllands-Posten, one researcher, Marko Juntunen, had noticed that there was a lot of support from the Muslims that he spoke to personally, but would not mention it publicly, but he noticed that there was a wide support for the drawing of the cartoons. I was just wondering in your own personal experience here in Sweden, have you had any Muslims in Sweden privately offering you support? Lars Vilks:No, I can’t say that I have, the only group was the ex-Muslims that came up, but I’m living in the countryside, and there are very few Muslims there, so I have no real possible, possibility to get into touch with people. So I can’t say that I have support from that side. Tundra Tabloids: But what about from outside of Sweden, support, where has it been coming from? Lars Vilks: Well from all parts of the world. Tundra Tabloids: Have you been surprised by it, or expected it? Lars Vilks: Well, when it went out in the world like that it was of course unexpected, but when that happens, I mean, I can understand that the question is interesting and that many people are concerned with it. I can see that groups that are working for freedom of speech and against political correctness in many parts of the world, so, so, I mean on the air, several countries small and big radio stations, and things like that have been used in the discussion. I mean, it’s very similar everywhere, you have kind of, what you can, what you cannot say, what is correctness. I mean it’s about the same everywhere. Tundra Tabloids:What kind of mark would you give the academic community, your peers, concerning their reaction to the drawing of the cartoon? From A to E being the worst? If you could grade them on their overall reaction to this. Lars Vilks:Well they did what they should. They are standing for something and they are representing something, and that was the idea of my project. I mean was going to show how is the agenda and how are the conventions, in the freedom of art, where everything today said is possible to do anything, and actually we have a problem because everything is done and can’t provoke anything more. And I had the idea that it’s very easy to provoke, you just need a small dog. And then you get the reactions, and the reactions come just as you expected, because they are speaking from this agenda, and from this agenda it’s understandable. Then you can say, is it really the best thing here, do we have some hypocrisy of some sort? Of which we probably have, because there are conventions in the art world, so they are reacting to that, and I’m very satisfied with that, because that is the point, to get that out, because if they all are already supporting me, well (laughter) then we are already there. Tundra Tabloids:The Swedish media. Now that’s a bit different story concerning the reaction of the academic community. What did you expect from the media, the Swedish media? Did they report things satisfactory, was there any misrepresentation concerning your views, or the reason behind your drawing? Did they accurately describe your sentiments? Lars Vilks: Of course there is a kind of reluctance in that, they didn’t really, they wouldn’t, they had been sort of, been scared of producing this news. When, it’s you obviously watch good news, they didn’t really report it immediately, there was several such situations like that, but on the whole I mean, it came out. And I think that the Roundabout idea, that it was a Roundabout dog, actually made it easier, because the news group presented about the Roundabout dogs, and it was diminished in the way, it was little cute you know, with the Roundabout dogs. But I would think that I would say that I’m rather satisfied with this thing here, and also you have the debates. Everything did was made as expected. One has to remember that it was a birth of debate on a sensitive matter and it had kind of waiting for that, now there was a reason to discuss it, and you could come out and discuss it without being accused of being this and that, and then everyone went out and it was kind of a hard battle that came about. But, I mean that I’m interested as an observer in that. I was also participating in the debate, because I made some points there. But it has to be said that, these things wasn’t planned. Tundra Tabloids: [Laughter] that’s pretty straight forward. Lars Vilks: The amateur came out, and after, I was invited to debate this, they wanted me to say something, and after awhile I learned the language, I knew they, this is the kind of questions always asked in the debate and this is what you answer. And everything is kind of a closed thing; very few new things are said there. And I think that is interesting because you can describe it, as a kind of geography, a map, “you have this camp here, and they have these arguments and this here and so on, which is the strongest, this is the dominate, “ yeah, all these things became interesting for an art project. Tundra Tabloids:Has anyone been able offer a credible counter argument against the publication of the Mohamed Roundabout dog cartoon? In other words, has any voice that you have noticed that has tried to be intellectually honest from their prospective, to say that it wasn’t something wise to do? What would you have to say to that type of criticism? Lars Vilks:It’s very common to say, it’s unnecessary provocation, but again, you have to remember the circumstances. When did it become something? It became something when the day the censorship came in, and the publication became something, and probably I would have been doing the same thing even if I knew that, because when you do something, if it’s bad it’s more interesting because it has another effect. So I mean, there is no doubt, that when you do something as an art, as an work, deliberately, you can take an art, it is by tradition much wider than in ordinary life, it’s just not a political issue, it’s kind of an aesthetic issue where you have the borders, an art is about offending and insulting really, it’s a history of provocations. And you transgress borders of things or another so, it should be quite an ordinary thing. Tundra Tabloids:Now talking about the political aspects outside of Sweden, outside forces that are maneuvering through the UN and through the EU body politic, what, how great of a role do you think that the Organization of the Islamic Conference, the OIC, which is headed by Ekemleddin Ihsanoglu, in playing, in getting the EU and the UN to place limits on free speech? Do you see that danger on the horizon? Lars Vilks:Certainly not. But I can see that there is, say, a basic kind of threat, but I mean it’s so clear that it’s known, I mean it’s known, been discussed and there is a very long way to make this into a kind of a reality and limitations. I don’t think that it will ever take place. That’s my opinion. But I mean I think that they, to achieve that, you have to discuss the thing and make things more known, so I don’t think that there’s anyone who’s disagreeing about that, that this is not a good thing, if you read you’ll find it so, so I don’t think that if you over estimate thing. I have the idea that very much of this is a tactic. Like you have here in Sweden, when you have this crisis with my drawings they write in to the ambassadors from Muslim countries and the prime minister met them, you know, and they had the talks and then they also has a seminar in the Swedish house of parliament, on the Arab League day, and then they took home their views of things. And they discussed this, so, then everyone went home, and that’s the kind of tactic of, “let them come, let them speak but give them really nothing”. I think that’s one sort of tactic you have, not to clash into another culture to forcefully. It could be something like that, but personally I don’t think that there is a great risk of going into some sort of sharia, in the western world. I don’t think so. Tundra Tabloids: Well that’s interesting, because many people do watch these things very vigorously, and see these bodies, for example, that’s represented in the Arab League or the OIC, and pretty much a relentless move towards trying to stifle free speech, which would directly effect of course the art world as well. For example Islamophobia, that is to limit any type of justifiable criticism. They alone are the arbiters of what is acceptable and what is not, and places in an unbearable situation, the free west, in a very untenable situation in second guessing what is permissible and what is not. Lars Vilks: Well the art world would probably be happy, because then there would be clear limits again to provoke…. Tundra Tabloids:[Laughter] There’s always another way at looking at this. I like that. Lars Vilks:Then it would be politically correct to attack them, they would be conventional, they wouldn’t represent the weak group anymore. I mean today you have this thing, is the weak group, we have to, this another culture, they are the weak nationals, we are the western world we have to and so, but if we turn things, then suddenly then..
Tundra Tabloids: How can other do that you have done, preserve free speech by using it to criticize sharia law and what should we prepare for if we do? Lars Vilks:It’s a holy area about Islam in the art world, so there is still things to be done. I mean, to make this kind of a conventional critique which it should be, you criticize Christianity or whatever you do, I mean so it should be also be possible to criticize Islam in that sense. So a, we can see that these things have been done, they are not pushed away. Tundra Tabloids:I believe that I already know the answer to the question before I even ask it, but since I have it here I will, do you have any regrets over the drawings whatsoever? Lars Vilks: No. And I don’t think that the project is at the end, I mean it’s still alive, I mean you could see yesterday that it’s still alive, it has not settled, the project could be shown, I guess that it could be shown a fragment of it, and it became a heavy discussion. There is still a boycott in the art world for the project and all these things are showing that this is still a process, another chapter in the story taking place yesterday. Tundra Tabloids: Now there was during the panel discussion, from the questions and answers with the audience and so forth, what were your thoughts on how that was all handled? It appeared to me that the panel was very open to hearing any type of opposition, it wasn’t really a matter of not wanting to hear what they have to say. Where you pleased with the responses of good and negative criticism? Lars Vilks: I’m not really fond of panel discussions because I don’t like the hierarchy you have, the panel, it’s just so heavy, and everyone has the time to speak, and they speak very long and they want the questions to be very short. It’s a kind of a master-slave situation there, and their not allowed to come with supporting questions and things like that to go into some sort of dialogue and communication directly, and this make things so heavy, and so slow, and so I like that they went out actually and responded outside of the rules you have, because it put some tempo in the whole situation, and became a bit interesting. I mean, otherwise you know when you sit there on a panel suddenly they start giving lectures, there’s a question then you give a lecture, and you understand that they’re taking the question out of context and the one who’s sitting there says, “well I need a supporting thing here“ but then they don’t have a right to say anything, because it has to move around and then you almost fall asleep before the end. So, I mean, there should be some hard moderation also for the panel. Because I mean, if there is an opposition, it’s a very interesting thing you know, the clash and the crash, you learn something from that, you learn what they represent. Tundra Tabloids:Well as a result, eh, that’s absolutely correct, as a result from some of the comments from the audience that generated a very good response by one of the panel members, and brought some of the people to their feet clapping. So yeah, I understand that direct confrontation does result in better…. Lars Vilks:Well there was thing when I was going to start speaking; there was someone who was made a protest, I really didn’t hear what she said, it was a more unarticulated protest of some sort, and I immediately made it a performance piece that this is part of the show, we’ve been training this thing before (unclear) ..and some people [laughter] even almost believed me that this was a planned thing but this was of course not. But I mean, I really didn’t react, I can understand that. I’ve got this design that when something happens, I see this as part of the art work, and I think that it’s more interesting than people just sitting still. Passion, feelings, creating opinions, people believing they’re right. They believe that they understand what I was doing, so I understand all that, I have seen it before, you talk about the artist but he’s not here, the artist is something that we construct together. It’s always a fiction, that the artist is the one who has intention with a work and that is the construction you make. To say that the artist meant this, meant that, and so on, so it becomes something else to the person himself. Tundra Tabloids: Thank you Lars Vilks for this interview. 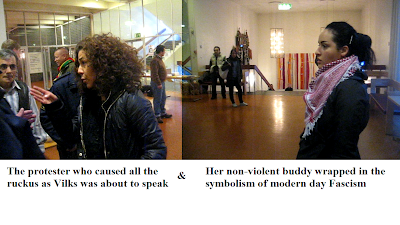 Previous Post Previous Post FULL VIDEO FOOTAGE AND AFTERMATH OF THE LARS VILKS’ ATTACK……!